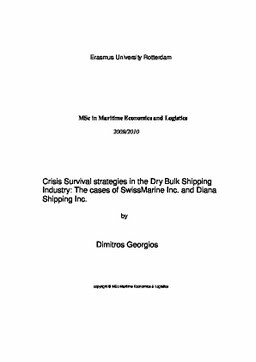 Erasmus University Thesis Repository: Crisis Survival strategies in the Dry Bulk Shipping Industry: The cases of SwissMarine Inc. and Diana Shipping Inc.
Crisis Survival strategies in the Dry Bulk Shipping Industry: The cases of SwissMarine Inc. and Diana Shipping Inc.
One of the most important issues affecting the proper function of the global economy during the last two years is the financial crisis of 2008, having consequences for every sector of the economy and production. The capital intensive character of shipping industry and its derived demand from the production couldn’t be unaffected (from the crisis) drugging them in a severe decline, creating the need for careful strategic planning and management due to the huge expansion of this type of industry during the previous years. The purpose of this project in a first level is to present an analysis of the shipping market and its course during the period 2007-2010, in order to be declared the basic conditions which affected the strategy of the companies. In a second level the thesis using the previous analysis in relation to case studies is extracting conclusions about the potential shipping strategies during the period 2007-2010 and how these were affected by this severe downturn of the market. The main aim of this study is to state and analyze the main strategies followed by the shipping companies during the pre crisis period in the different sectors of the company’s operation and how they have been adopted to the new market standards(financial crash) protecting their profitability. The dissertation concludes with two case studies in order to be examined from a practical aspect all the possible strategies that were followed by companies of different sizes and which contributed to their survival and responsiveness during the crisis. The main focus is in chartering strategies during the pre crisis period, during the crisis period and to show how this crisis is affecting the future chartering planning. An effort to distinct and differentiate the strategies of these two companies is made and an analysis to their contribution to the survival of the companies is realized.